3/2/2007 - ARNOLD AIR FORCE BASE, Tenn. (AFNEWS) -- I will never forget that Sunday afternoon in Maryville, Tenn., when my parents received a phone call. My mom answered the phone and made the tell-tale gasping noise she only makes when something is wrong. She started crying and then hung up the phone. She told us my cousin had been killed in Iraq. Army Staff Sgt. 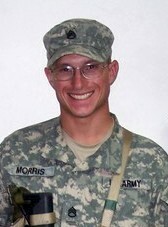 Daniel Morris, 28, Nov. 25 in Al Judiah, Iraq, when a roadside bomb exploded near his vehicle. 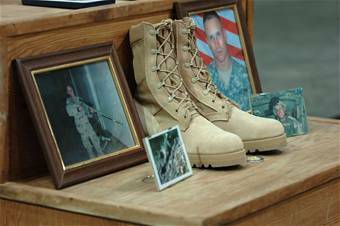 Daniel was one of four Soldiers in a HUMVEE. The other three Soldiers received varying degrees of injuries. Daniel took the brunt of the explosion. He was a Bradley Armored Personnel Carrier operator assigned to the 1st Cavalry Division, Fort Hood, Texas. Sometime after Daniel's funeral, I was on my way home from work, stuck in interstate traffic, when I heard the song, "This Is Your Life" by the band, Switchfoot. Within the song is the lyric, "This is your life, are you who you want to be?" I began thinking about my cousin and all of the events surrounding his death. While listening to that song, I realized the type of person Daniel really was. Daniel was a loving person. He was a son, a father and a Christian. But most importantly, he was a Soldier. When he was just a kid, Daniel had dreamed of joining the Army. He was exactly who he wanted to be. The stories friends and family shared about Daniel's faith and commitment to duty reinforced that. For example, Daniel bought a car for the sole purpose of picking people up and taking them to church on Sunday mornings. He replaced the front door of the Servicemen's Home he lived in before he left for Iraq. He bought a riding lawnmower so members of his church congregation could mow their property. Everything he did, he did for the glory of God. There is one story in particular I will never forget. Reverend Matthew Reed, the minister at the church Daniel attended near Fort Hood, keeps a map with pushpins in it to show where all the soldiers he knows are deployed. Before Daniel left for his second tour of duty in Iraq, he gave Reverend Reed a Purple Heart pushpin. Daniel may have felt he was not coming home, but he went anyway. He went and proudly served his country. And, like so many of our Soldiers, Sailors, Airmen and Marines, he gave his life for his country and for the Iraqi people. It was who he was. He likely could have answered the song's question, "Are you who you want to be?" without giving it a second thought. The lessons I learned from Daniel are amazing. I realize that I am not invincible. Along with the good, bad things can and will happen. What is important is how I choose to deal with whatever happens. I have learned that making the most of my life should be a much higher priority on my "to do" list. I cannot accomplish anything by sitting back, being complacent and letting the world move around me. Instead, I should, as they say, "Grab the bull by the horns" and take advantage of every opportunity that comes my way. Daniel will always be my hero. He will always be an example of someone who unselfishly gave his life and lived every moment being exactly who he wanted to be. Not everyone can say the same. The challenge? It's your life. Are you who you want to be?